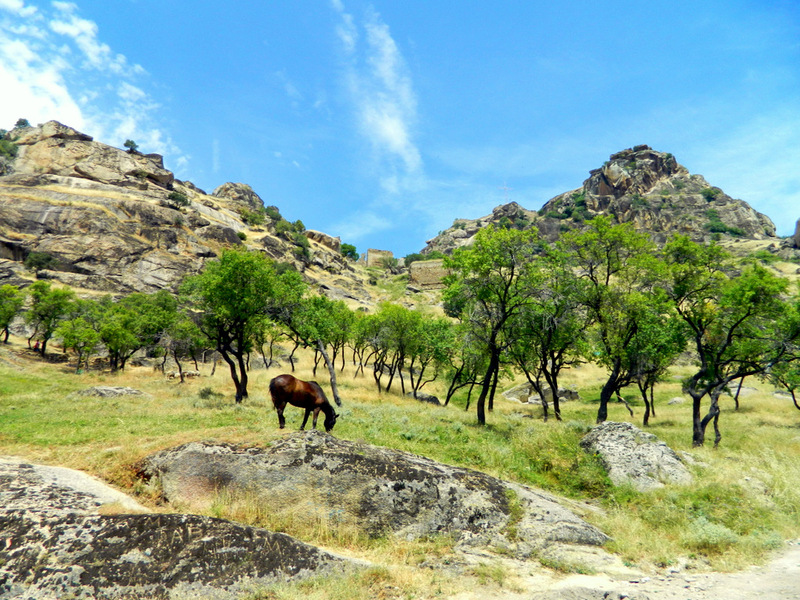 In one day, while hiking from Prilep to Treskavec Monastery (and back), I saw the range of animals living in Macedonia, some of them expected, others unexpectedly exotic. Horses are no surprise in a landscape that could be used for shooting Western movies. Resting and seeking shade under a tree, I heard something move in the foliage. It was a sound like from a large animal, one that shouldn’t be living on trees. Like a crocodile. 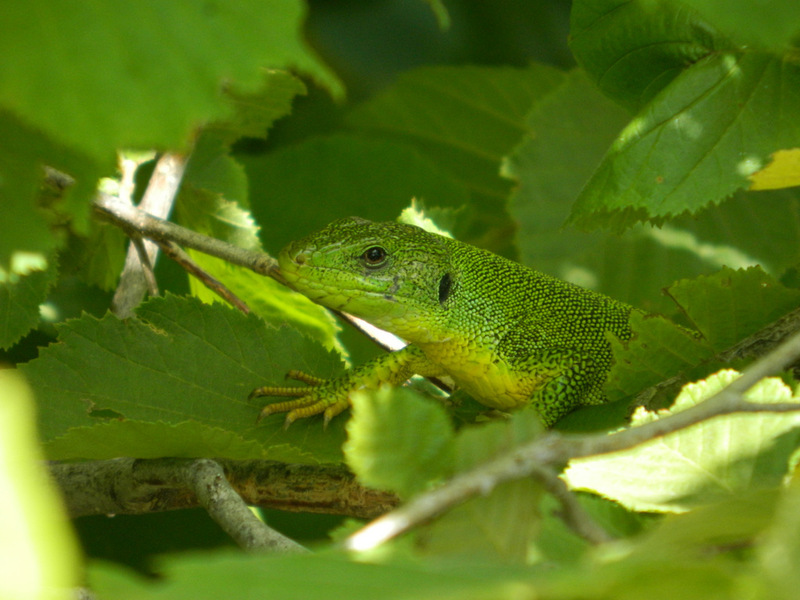 It was not easy to spot because it had exactly the same color as the leaves, but luckily it remained still once it noticed my curiosity: a green lizard. It was quite big. I didn’t see the whole tail, but the main body was at least 10 cm long. And fat. Of course there were also hundreds of common lizards along the path, but I didn’t take any photos, maybe because I am so used to them by now, after living around the Mediterranean for a while. The other animals of which I sadly didn’t capture any photos were butterflies. They were too fast, I was too slow. At times, five or six of them were circling around my head. Bright yellow ones, green ones, blue ones, butterflies with stripes, butterflies with see-through wings and butterflies in black, many of them bigger than the butterflies I had seen thus far. “Whoa!” I screamed out in surprise, when I almost stepped on this animal by accident. At an altitude of around 1,000 meters and in a very dry landscape, I really wouldn’t have expected to see a turtle. I used to think they prefer lakes or rivers. And then the most surprising find. What’s the last animal you would expect in the hills of Macedonia? 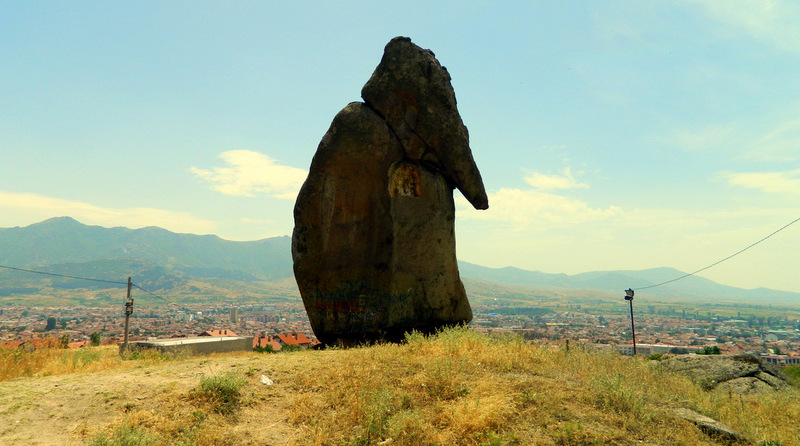 I don’t know if it regularly lives here or if it had escaped from a zoo, but there was an elephant, looking down on the town of Prilep indecisively. 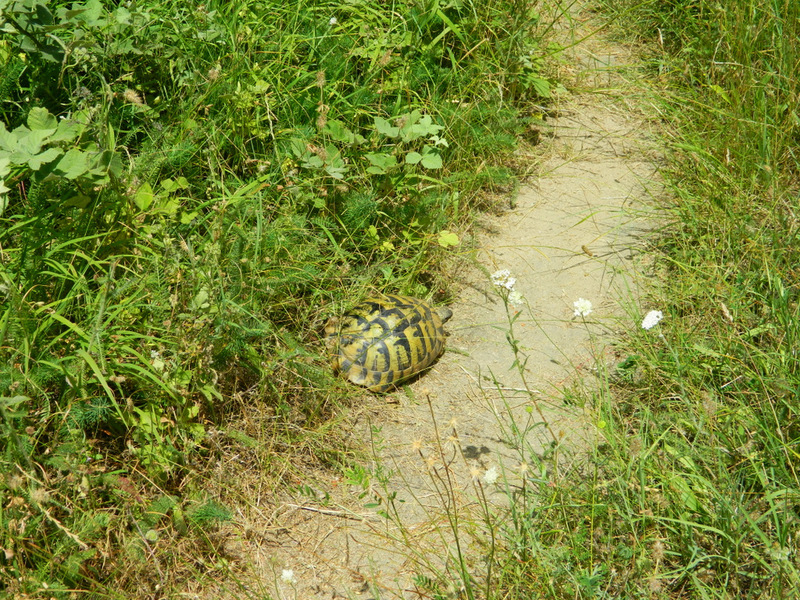 This entry was posted in Macedonia, Photography, Travel and tagged animals, nature, Prilep, Treskavec. Bookmark the permalink. Nice. The green lizard posed for portrait as did the elephant. :) Though I could be totally mistaken, I am guessing that the turtle may be actually some kind of tortoise (a more land oriented variety of ‘turtle’. I think you could be totally right, exposing my complete lack of knowledge. I always thought that “toirtoise” is simply the French word for “turtle”, but I just had to discover that that would be “tortue”. But it is more enjoyable with the text, I must say. I also enjoy writing more than taking photographs. It’s much more relaxing to walk around only with a notepad and a pen instead of a heavy camera. But even fewer people would read a blog with text only. I wish it was the 19th century.